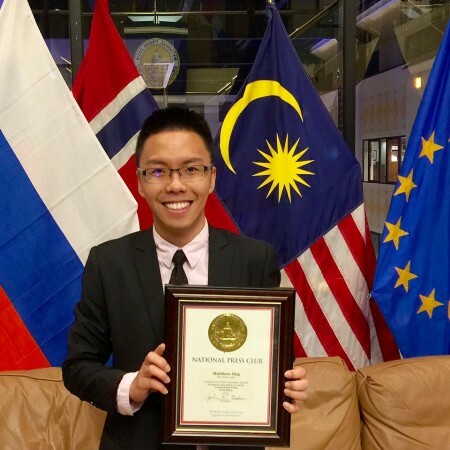 Three years ago, Matthew Ong was a Marquette University student and an intern at Milwaukee Neighborhood News Service. Today, he is an award-winning reporter for The Cancer Letter, an investigative oncology news publication based in Washington, D.C. In a two-year investigation, Ong covered the controversy over power morcellation, a then-common gynecological procedure for hysterectomies and removal of uterine fibroids performed in more than 100,000 women a year in the United States. Using the procedure on women with undiagnosed uterine tumors can spread cancer to other parts of the body. Ong analyzed data, reviewed documents and conducted interviews with numerous sources, including women who had been subjected to the procedure with devastating results. His in-depth reporting contributed to changes in public policy in 2014: the Food and Drug Administration restricted the use of power morcellators; hospitals across the U.S. stopped performing the surgery; and insurance companies have largely stopped covering the procedure. Ong’s series also ended a clinical trial at a Harvard hospital. In 2015, Ong examined how the U.S. system for regulating medical devices — not just power morcellators — creates a systemic problem in American medicine. The FBI, the Government Accountability Office and the Subcommittee on Oversight and Investigations of the House Committee on Energy and Commerce are now investigating possible failures by hospitals and manufacturers to report adverse outcomes to the FDA. . In 2015, Ong received two first-place national awards for the series — the National Press Club’s Newsletter Journalism Award for Best Analytical or Interpretive Reporting and the Society of Professional Journalists’ Sigma Delta Chi Award for Excellence in Public Service Journalism — as well as a Dateline Award from the Washington, D.C., chapter of the Society of Professional Journalists. “I’ve been told that my reportage has saved lives,” Ong said. Since he started covering the story in 2014, more than 300 patients and families have come forward claiming harm, and at least 50 lawsuits have been filed. The Cancer Letter has been covering the business, political, financial and regulatory aspects of cancer research for 40 years, “truly a niche within a niche in medical journalism,” Ong said. The Cancer Letter offered Ong a job in May 2012, when he was selected by the Washington Media Institute and the Diederich College of Communication at Marquette to go to D.C. for an internship. Ong is currently a reporter of The Cancer Letter. His stories have been picked up and featured by The Wall Street Journal, The Washington Post, ABC News, CBS affiliates, The Boston Globe, Science, Nature, Inside Higher Ed, Houston Chronicle, The Philadelphia Inquirer and the American Association for Cancer Research. Ong credits his experience at NNS and Diederich for enabling him to get the job and gain the skills necessary to do it well. “Very few [reporters] have had the privilege of writing in-depth stories when they were in college about citywide policies and issues that affect many people,” Ong said.